A book about the struggles and rewards of family farming is the pick for the 2019 All Iowa Reads program. 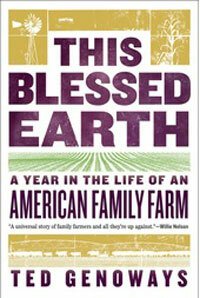 It’s called “This Blessed Earth: A Year in the Life of an American Family Farm.” Helen Dagley, a research librarian at the State Library of Iowa who oversees All Iowa Reads, says the author Ted Genoways is a fourth-generation Nebraskan, but he used to live in Iowa City and got one of his degrees from the University of Iowa. “Our current choice for 2019 is about the land and good use of the land and water and resources and things like that,” Dagley says. “All of those things and more are of common interest to both states.” For the first time, the same book will also be read next year in the state next door as part of “One Book One Nebraska,” which operates much like All Iowa Reads. Dagley says, “The two states have so many things in common, including the author who loves both states and writes words that will resonate with both sets of readers.” The goal of All Iowa Reads is to create a sense of unity through reading by encouraging Iowans to come together in their communities to read and talk about a single book title in the same year. Libraries, book clubs, schools and other local organizations are encouraged to sponsor discussions of the title. “It will give rise to discussions within the people who are reading it whether they are farmers themselves or city dwellers,” Dagley says. “The issues from the farms really resonate with people who are living in the city when it comes to crop production and clean water and different things we see in the headlines almost daily.” The two programs picked a joint selection for the upcoming year as the combined Iowa and Nebraska Library Associations Conference will be held in Omaha in the fall of 2019. Genoways lives outside Lincoln and his book tells the story of a farm family from harvest to harvest, facing challenges from rising corporate ownership, encroaching pipelines, groundwater depletion, climate change and shifting trade policies.